Amazon has joined the likes of Google, Dropbox and Facebook by offering automatic photo uploads through its Cloud Drive Photos app for Android. Users of the retailer's online storage locker can use the Android app to back-up photos, the moment they're taken on a smartphone or tablet. The app offers 5GB of free storage so there's plenty of space for your prized smartphone snaps, which can be uploaded over Wi-Fi and 3G. The new update mimics the functionality offered by the rival Dropbox storage solution, while Google+ Instant Upload and Facebook Photo Sync also upload photos to private folders on their networks, making sharing easier. 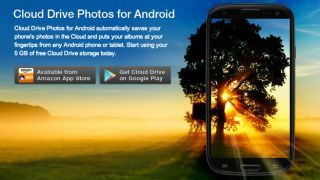 The Cloud Drive Photos app was launched in November with the aim of making it easier to safely stow snaps online. At that time there was no automatic upload feature. Alongside the auto-upload functionality, Cloud Drive Photos now also features a built-in camera interface, meaning it can replace the Camera and Gallery apps on your Android phone if you're so inclined. There's still no sign of the app for iOS devices, although they can access the main Cloud Drive apps.